It’s like a Nancy Drew case. Why didn’t the lettuce germinate? Why the empty garden bed? I’m facing the case of the disappearing lettuce now, and I think I know the answer. Temperature: Lettuce is fussy about temperature, that’s for sure. It prefers soil temps somewhere between 40 – 80 degrees, but if it’s too warm, it won’t germinate, and too cold, it won’t sprout, either. I planted my lettuce seeds around the same time as I do every year (March) but this year’s March weather was uncertain. Some days, we had lovely 60-degree days, but then the nights dropped below freezing. It’s possible that the lettuce germinated but an early frost killed it. Light: Lettuce is photodormant, which means it won’t germinate in darkness. I know I buried this particular patch of lettuce seeds too deeply. 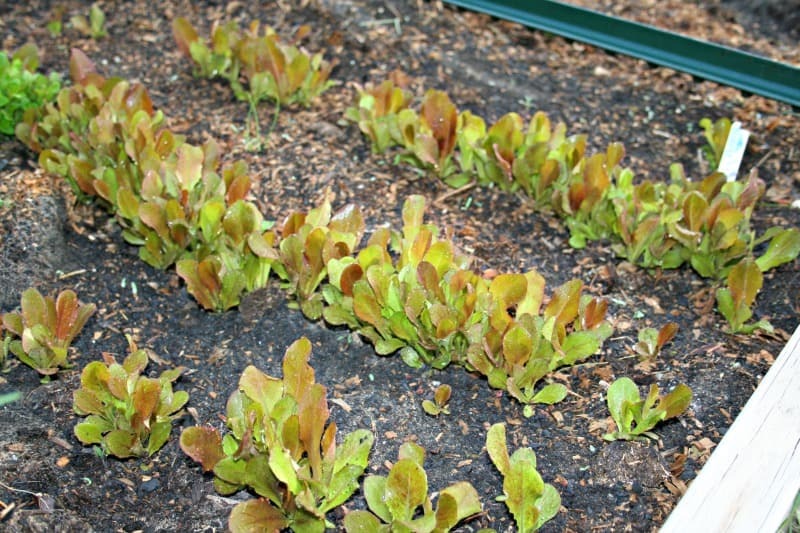 Lettuce seeds look like grass seeds, which as many homeowners know, is also photodormant. It needs light to germinate so you sprinkle it on top of the soil and lightly work it in. In my case, however, I dug it in about 1/4 to 1/2 an inch deep, following the package directions (which were wrong). To correctly plant lettuce seeds, sprinkle them on top of the soil, and then sprinkle a bit of soil over the seeds. Don’t pour soil over it or as I did, dig it in. If the seeds are too deeply planted they won’t receive light and yes, they stay dormant. Cats: I love my cats, but they are pains in the neck in the raised garden beds, especially in the spring when they shed. They get itchy, and they love to roll around on the ground. Mostly they roll on the gravel driveway, which is fine. It scrapes their loose fur off and we’re all happy. Sometimes they toll on patches of dirt, which infuriates my husband because there was once grass growing happily in that spot until lit was rolled on by seven crazy itchy felines. However, in the raised bed, they can be destructive little beggars. They dig up seeds when they dig their latrine holes. Mostly, however, as I wander around the raised beds weeding or tending my plants and my back is turned for the moment they roll around on the plants. And that’s when the trouble arises. I think several cats squashed whatever had germinated. You can keep cats out of the garden with screens or covers over the plants. One method uses a special plastic with flexible plastic spikes on it, kind of like the mats you put down on office carpet to protect it from rolling chairs. The spikes won’t hurt kitty or the wildlife but they do discourage the rolling behavior. I haven’t resorted to spokes just yet. I replanted my seeds and hoped for the best. Old seeds: These particular seeds were from a reputable seed company, but they were over a year old, so they may have been past their prime. I will often purchase seeds from the dollar store or discount stores. Many of these seed packages are older and have lower germination rates. The Roma tomato seeds, for example, that I planted from the dollar store seed package did not germinate but the ones purchased from a national and reputable seed catalog did. That happens with some types of seeds. There are germination tests you can perform to see if the seeds are still viable, but I just plant and hope for the best. I know that it wasn’t water or lack of water since I did pull the garden hose out and give the seeds plenty to drink every day. The Garnet Lettuce seeds, planted from a package purchased from Baker Creek Heirloom Seeds in the next raised bed over, is thriving, so I’ll have lettuce at last. I cracked open another package of seeds and a second package fo Romaine (Cos) and sprinkled it on the surface of the empty bed. I shooed Rocky and Shy Boy, two of the cats, away from the area as I worked; both were intent on discovering what I had just sprinkled on the soil. With luck and today’s rainy forecast, I might just solve the mystery of why my lettuce seeds didn’t spout. It’s a case that might baffle Nancy Drew but not this gardener!